Propain has continuously given back to the city of Houston, including the Hiram Clarke community that raised him. With the academic year approaching the rapper decided to reach out again, bringing back his annual “Hoops For Hip-Hop” celebrity basketball game. Linking up with Forever Trill Muzik Group, the event was created in order to assist over 1, 000 students with school supplies for the upcoming school year. 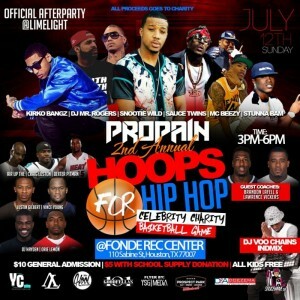 Returning to Houston’s Fonde Recreation Center on July 12th, Pro was joined by a number of artists, athletes and personalities including Lawrence Vickers, Lanny Smith, Snootie Wild, Kirko Bangz, the Sauce Twinz, DJ Mr. Rogers and more with additional coverage from 97.9 The Box and 93.7 The Beat. He was also assisted by the office of Senator Rodney Ellis, who will team up with Pro again for his 4th annual Hair Cut and supply giveaway on August 22nd. With his upcoming Against All Odds album on the way, the rapper has made it known that it’s not always about the music, sometimes it’s about giving back to others. Check out some shots from the game below courtesy of Indmix.com.